Ocasio-Cortez is a charismatic progressive who right now represents a legitimate challenge to entrenched dynamics in Congress—older, whiter, male, obsessed with a bizarre set of social expectations about “how things are”—which makes her a problem to be handled. This is what it looks like to do that. A narrative is emerging to belittle her as all flash and no substance, or a liar, or selling some version of progressive snake oil, or all of those things at once. The reaction from the Times reveals, too, how “neutral” reporting contains a low-grade but prevalent skepticism of progressives. Ocasio-Cortez, a democratic socialist, ran against Joe Crowley and won by campaigning on universal healthcare, immigrant rights, fair wages, and labor protections for workers. The Times barely covered any of it until she won. And so now you see the fear—and drive to marginalize her place in Congress—stemming from the same skepticism and, often, disdain. 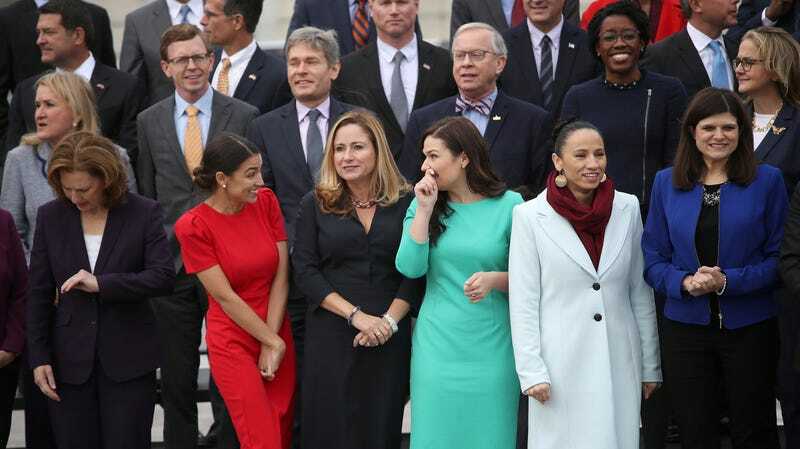 Ocasio-Cortez’s arrival on Capitol Hill has been almost universally heralded by as a sort of reckoning for the Democratic Party, and DC at large. The label, when coming from mainstream and conservative outlets, is reliably finger-wagging and fear-mongering. On the same day Ocasio-Cortez says she was mistaken for a spouse, she shared a screengrab from Fox News where her headshot, along with Rashida Tlaib’s, Ayanna Pressley’s, and Ilhan Omar’s, hover ominously next to a list of their stated goals—among them “Free health care for all” and “Abolish ICE.” “Fox News discovered our vast conspiracy to take care of children and save the planet,” she captioned it. On social media, Ocasio-Cortez maintains a level of graciousness and even joy over these putdowns (a tactic familiar to many immigrants or children of immigrants; when they go low, you go high, etc.). But the fact remains that she can expect to be a regular target of this kind of gross, gendered attack. Scarry’s and other’s skepticism about Ocasio-Cortez’s apparent financial situation and the aesthetics of struggle accomplishes being deliberately mean and infantilizing while erasing the rules she is reacting to: the idea that a freshman congresswoman wouldn’t dress up for such a high-profile job is out-of-touch with the reality faced by so many women who work in male-dominated industries. Many clamored to explain this to Scarry. Alexandra Schwartz, a staff writer at the New Yorker, noted on Twitter that Ocasio-Cortez has a subscription to Rent the Runway (and that it was originally a gift from a friend). Schwartz’s defense of Ocasio-Cortez’s wardrobe and means was surely well-intentioned, but even such defenses tell an equally harmful story about Ocasio-Cortez and how working people are “allowed” to look. Women who grew up poor or working-class, women who say they struggle, are told they have to look are certain way in order to believed. They should only have certain things. In this framing, Ocasio-Cortez’s coat—plain, black, and wholly unremarkable—functions much in the same way flat-screen televisions and nice sneakers show up in conservative rhetoric about people on Medicaid or receiving food stamps. The underlying sentiment is one of disdain, a disgust at the idea of a person living well. What are you doing here?, it says. Do you have any idea where you are? Ocasio-Cortez is already facing an uphill battle as a progressive Democrat in the House: on her first day of orientation, the Bronx native sat in on a protest outside of Speaker Nancy Pelosi’s office, aimed at getting her to commit to a robust plan to stop climate change. That cameo has already reportedly led to some grief in closed-door meetings, and more fake-nice advice in Ocasio-Cortez’s Twitter mentions. These swift reactions are telling, revealing an aggressive tendency found in centrist Democrats of valuing the image of compromise over the potential good of radical ideas. But remarks like Scarry’s or “neutral” reporting that is nevertheless contemptuous just underscore that she was always going to be fighting two battles at once: one to deliver on the promises she made to her constituents, and one with the powerful people who will try to make sure she can’t.